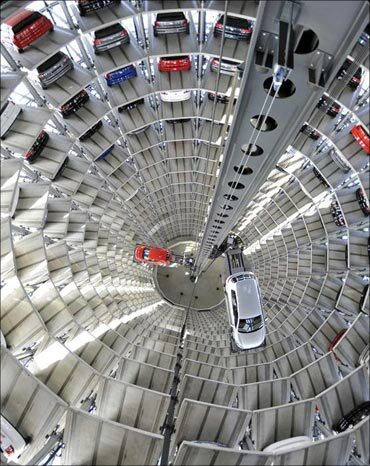 Volkswagen's Car Towers -- at the theme park Autostadt next to the carmaker's plant in Wolfsburg in Germany -- are transparent cylindrical buildings that rise 150 feet to 490 feet above the ground. 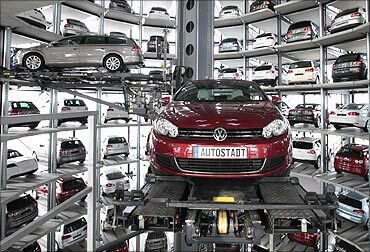 Image: Volkswagen Golf Cabriolet and Volkswagen Passat are stored at the CarTowers in the theme park Autostadt next to the Volkswagen plant in Wolfsburg. 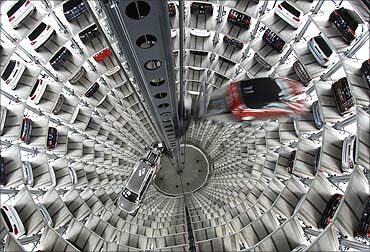 These buildings are linked by a fully automated delivery system to the Volkswagen factory and the KundenCenter where VW customers pick up their new cars. Image: New Volkswagen models at the CarTowers. 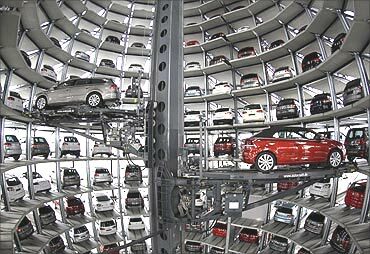 The car tower works like a giant vending machine. 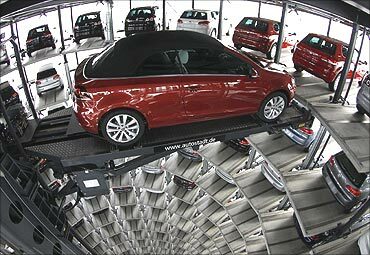 When a new car from the Volkswagen plant arrives, it is transported by a robot to an empty storage slot in one of the towers. 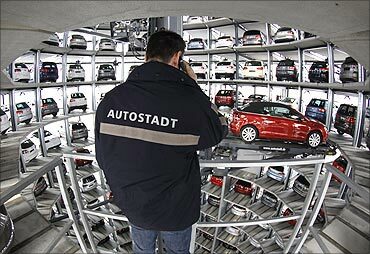 When the buyer comes to collect his car, the same robotic picking system fetches the vehicle that is required and brings it to the ground level. The car is then sent to the KundenCenter in the next building. 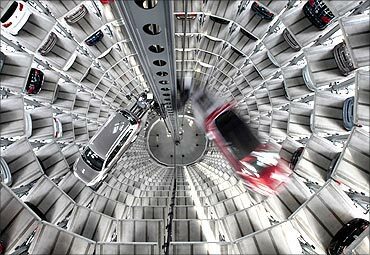 Each tower can hold about 400 cars on 20 levels and can process a car every 45 seconds during peak time. CarTowers have now become a tourist attraction. Earlier, tourists were not allowed inside the tower, but now for a nominal charge one can get to see how they operate from inside for 15-odd minutes. 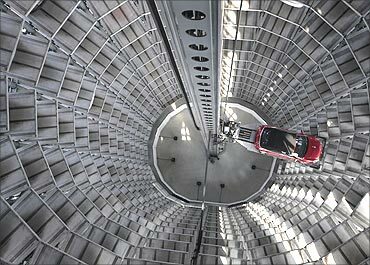 Visitors enter a glass box -- that can accommodate 6 people -- and are carried to the top storey of a car tower by the same robotic lift used for automobiles. 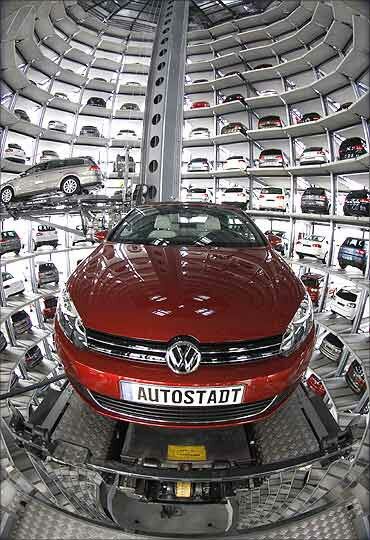 Germans commonly order customised vehicles through their local car dealers but collect the cars at the factory. 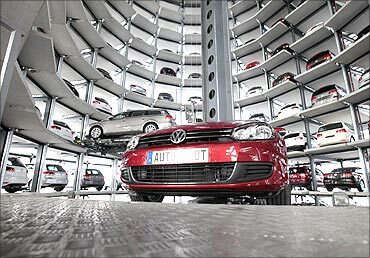 Volkswagen's KundenCenter (customer centre) in Wolfsburg delivers about 550 new cars everyday.